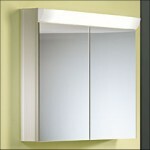 Schneider produce a high quality range of bathroom cabinets with mirrored fronts and lighting. All the parts used come from first-class companies in Europe and before a Schneider product leaves the factory, qualified members of staff carry out a detailed function and quality inspection, which also includes the electronic tests. Each item is backed by a unique awareness of quality, together with more than 50 years' experience of innovation and manufacture and, all available from Newport Bathroom Centre so please telephone us on 01633 262629 for our latest brochures, prices and offers. The halogen lights in the Schneider HipLine range put a glow on every face and the minimum cabinet depth and superlative breadth of range create a great impression in any bathroom. 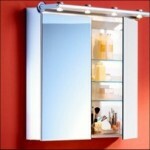 The idea behind the Schneider PeakLine sliding mirror cabinet is as simple as it is ingenious: the movement is not in the mirror, but in the cabinet, which rolls sideways! 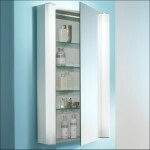 Thanks to its innovative construction method, the sliding element glides sideways to the left or right behind the mirror, and all the toiletries needed everyday are quickly to hand on four shelves. 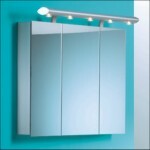 Schneider PrideLine has either a halogen lamp or a simple fluorescent lamp cleverly embedded into the bathroom mirrored cabinets. 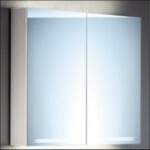 It provides general illumination, and has a continuously adjustable brightness level. 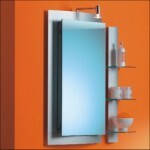 High quality mirror surface on the inside and outside of the doors. No visible lamp, just an illuminating mirror - innovative lighting and LED technology allows the Schneider GraceLine bathroom cabinets to fill the room with the full spectrum of light. The filigree working of the mirror doors adds and extra sparkle. 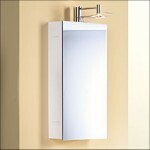 This elegant sweeping anodised aluminium structure provides a perfect optical illusion as well as an optical showpiece. Schneider QuadraLine's riveted construction seems extremely flat, but it concels a roomy cabinet with a perfectly normal depth. The double mirror doors stretch out to the full, allowing these spacious cabinets made of 2-component plastic to step elegantly into the background. The Schneider RonLine is exceptional in its options, with a single-element mirror or symmetrical divided mirrors, and its interior is carefully thought through to the smallest detail. 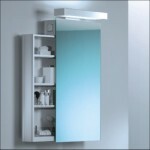 The Schneider SplashLine range extends the multi-functional aspect of the mirrored cabinet still further by incorporating an illuminating element: individually-switchable indirect space lighting, including internal lighting inside the cabinets and powerful mirror illumination, all combined within one single light unit. The profile structure of aluminium side components and elegant rounded lights used by the designers in the Schneider WangaLine have enabled them to create syntheses that set a new standard of beauty for bathrooms.